_________, who was having subjective paranormal experiences, contacted the Southern Wisconsin Paranormal Research Group (S.W.P.R.G.). He has been renting an upper flat in Milwaukee, WI for the last 1-½ years. He is 33 years old and reports no prior paranormal experiences. , the renter of the lower flat for the last 5 years, is 42 years old and also reports having subjective paranormal experiences. She indicates that she has had past paranormal experiences. _________also report the following phenomena: various noises, flickering lights, spots flying by, shadows, weird feelings, footsteps, and the appearance of a figure all in black. also reports having frequent nightly ‘attacks’ in which he has the feeling of being choked. Hall Effect Gauss meter from Integrity Design and Research Corporation (IDR-309). A bare probe was used with the gauss meter. 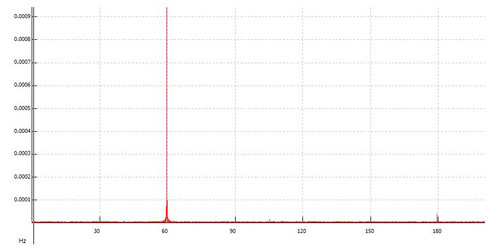 The bandwidth of the bare probe is 68Hz at 3dB. Sper Scientific Electromagnetic Field Test 840025 EMF meter. Bandwidth is 30 to 400Hz with 4% accuracy at 50Hz/60Hz. Data is displayed as mG.
All sound data was digitized and processed using Acid Music 4.0 and Audio Cleaning Lab 3.0. 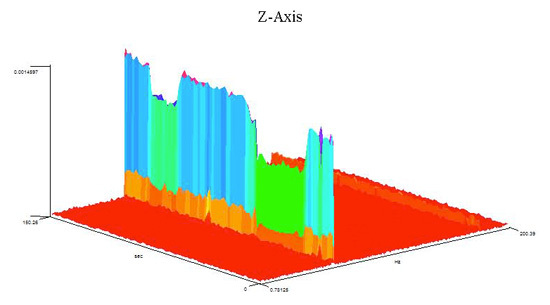 Potential EVPs were analyzed using Goldwave and Raven software. Go!Motion Vernier ultrasound motion detector with supplied Logger Lite v1.3 software. 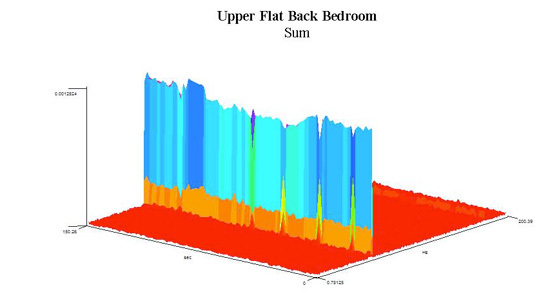 Fluxgate Magnetometer Model 539 with APS software. Set to collect approximately 400 samples per second. 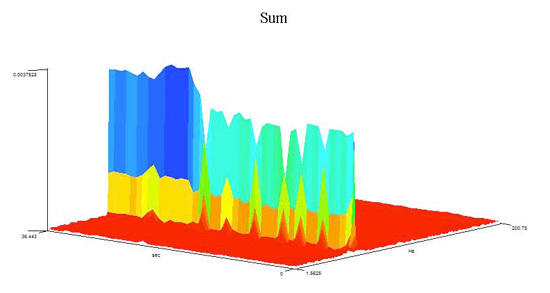 Data was analyzed using SigView. 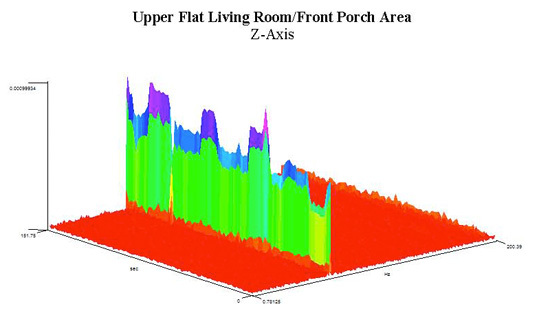 We decided to set up the equipment on both floors in the locations where the majority of activity was reported (upper flat: living/dining room area, hallway, and back bedroom; lower flat: hallway, bedroom, back bedroom, and living/dining room area). Surveillance cameras (IR DVR and DV cameras) and D.E.A.D. system were placed throughout the before mentioned areas. Ion counts, gauss meter readings, and radio frequency analysis was done. Various data sweeps were done throughout the location. Investigator personal experiences were recorded. EVP sessions were conducted in both flats. One interesting picture was taken during the course of the investigation. Ion counts ranged between 400 to 700 negative and positive ions/cm3. This is within the normal expected range. 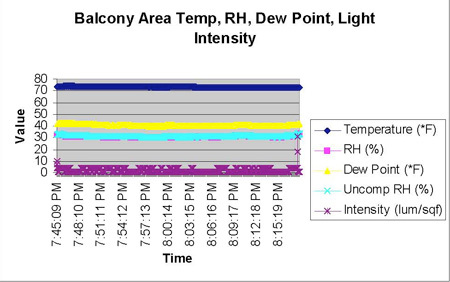 Gauss meter readings of 500 to 700mG were recorded throughout various locations in the building. This is within the normal expected range. 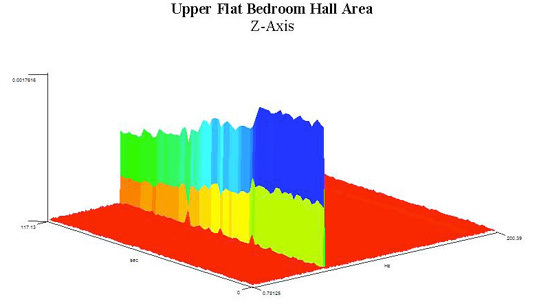 Baseline EMFs were 0.4 to 2.4mG. Complete crew plus Conditions: Some car and voice noise from outside. Outside church bells sounded at one point in session. We did close windows early in session but faint noise from outside still came through. Results: At one point in the session several people heard what sounded like a voice responding to a question. File: 01 S1 Audible sound Time: 8:55:52 Comments: Hard to prove this was paranormal especially with all the outside noise at this time. It was clearer then any other outside noises. Session 2 9:09PM Upstairs porch entryway Complete crew plus Conditions: Same as session 1 Results: Possible whisper, very weak File: 02 S2 Whisper, 03 S2 Whisper segment 13 Dbl Time: 9:09:10 -13 Interpretation: ? File: 04 QO Whisper, 05 QO Whisper segment 10 Dbl dn Time: 9:34:44 Classification: Class C Whisper Interpretation: I got it Comment: This occurred after I pulled out the night light and and I were commenting how bright the night light was. File: 06 QO1 Whisper 2, 07 QO1 Whisper 2 10 Dbl dn Time: 9:38:58 -59 Classification: Class B whisper Interpretation: "Picture....Ha ha ha ha.....cute" Comments: At this time I was taking pictures of the headboard because said he saw a light there. the time that follows the question but nothing distinctive. File: 09 S3 Segment of audible sound 2 Time: Between 10:09:01 and 10:09:06 Comments: This was recorded 8 minutes into the session. During the time that follows the question, "Is there a man here tonight that would like to speak to us? ", you can hear a siren but several people felt they heard a "Yeah" response also. File: 10 S3 Interjected voice, 11 S3 Interjected voice Segment 10 Dbl Time: 10:12 Classification: Class B voice Interpretation: "Yes Sir" Comments: Dave and Cindy are talking about the sounds we had just experienced. This voice was interjected into their conversation. Explanation: At the same time on a different recorder a similar cadence is picked up but it lacks the lyric quality of a voice. Could this suspected EVP just be a distortion of the recorder. Many EVP researchers claim it is unusual to get the same EVP on two recorders. This hypothesis is based on individuals experience and not on a study of this phenomena. The majority of interesting data was that which happened during the time Cindy Heinen reported her experience (see the Pictures section above). 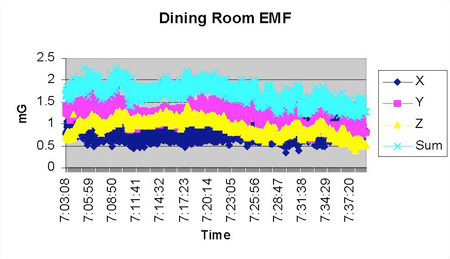 The EMF in the dining room area was found to have a high level of variability. 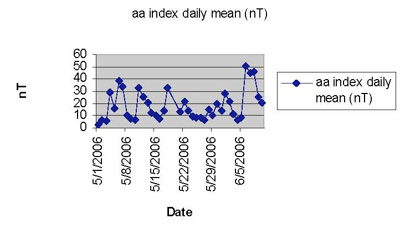 The following graphs show the time based FFT analysis from various locations. It is evident from the above graphs that there is considerable amplitude variability in the 60Hz field over a given time course. 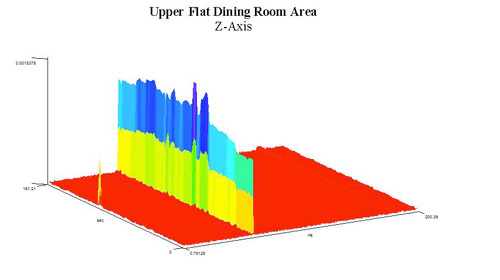 EMF amplitude and frequency changes have been noted in other investigations of ‘haunted’ locations (Braithwaite and Townsend, 2005). Research has implicated that low frequencies are important for triggering neurophysiological shifts and invoking experiences in individuals (Bell et al., 1992; Bell et al., 1994; Randall and Randall, 1991; Persinger and Koren). Naturally produced geomagnetic fields have also been implicated in reports of anomalous activity (Persinger et al., 1973; Persinger and Koren, 2001; Roll and Persinger, 2001). In addition, magnetic field variability in the 11 to 15nT range has been detected in locations where people have reported paranormal activity (Wiseman et al., 2002; Wiseman et al., 2003). Even though the pulses are created from the 60Hz field, it could be detected by the brain as a change in the static field (Braithwaite and Townsend, 2005). AC fields are not complex magnetic fields, but they can be complex in the fact that they vary in time and amplitude. These Experience Inducing Fields (EIFs; Braithwaite, 2004) have been found at other reportedly haunted locations and may be the cause of anomalous perceptions from ambiguous sensations to hallucinations (Persinger and Koren, 2001; Persinger et. al., 2001; Persinger and Richards, 1994; Persinger et. al., 1997; Roll and Persinger, 2001). This affect is even more probable in individuals who have an increased neuronal hypersensitivity and susceptibility to these fields (Cook and Persinger, 2001; Makarec and Persinger, 1987; Persinger, 1983, 1984, 1988, 1993a, 1993b; Persinger and Makarec, 1993; Persinger and Koren, 2001; Persinger and Roll, 1985). This is known as temporal lobe lability and can be assessed using the Temporal Lobe Signs (TLS) inventory. Patients with electrically active foci in their temporal lobes experience things such as: déjà vu, visual hallucinations, sense of presence, mystical/paranormal experiences, unusual smells, anomalous voices or sounds, and anxiety (Bear and Fedio, 1977; Geschwind, 1983; Gllor et. al., 1982; Goldensohn, 1983; Horowitz and Adams, 1970). Therefore, it seems reasonable that the greater number of temporal lobe symptoms a person experiences, the stronger their behavior and personality should resemble that of a person with an electrically active focus within the temporal lobes (Persinger and Makarec, 1987). Based on this information and the fact there are potential EIFs in the location, we decided to have ______________ answer the Temporal Lobe Signs question set (Makarec, 1990). There are 30 questions and the number of ‘yes’ responses are tallied. Both individuals scored relatively low (_____ =5 and______ =4). Higher scores are generally more characteristic of the above-mentioned effect. While we cannot rule out the possibility of paranormal phenomena, we must exclude all natural possibilities before its’ consideration. Specifically, the potential natural explanations for the night ‘attack’ episodes and the floating white and black ‘flecks’ will be discussed. Visual perception of luminous blobs and other beings in the bedroom (Conesa-Sevilla, 2004). There is also limited research showing a correlation between SP and geomagnetic activity (Conesa, 1995, 1997; Conesa-Sevilla, 2004). Autokinetic effect. The autokinetic effect is the perception of a stationary point of light in the dark moving. Psychologists say the cause of this perceived movement when there is none is due to "small, involuntary movements of the eyeball" (Schick and Vaughn, 1995). It has been shown that the autokinetic effect can be further enhanced by the power of suggestion (Zusne and Jones, 1990). Electromagnetic field (EMF) induced. 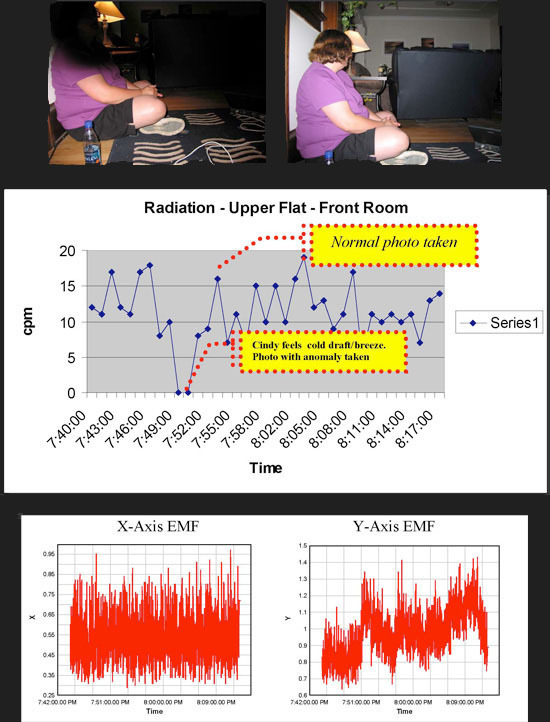 In the laboratory, transcerebrally applied frequency and amplitude (‘pulsed’) EMFs have led individuals to report a variety of phenomena like those reported in haunted locations, including: shadows, the feeling of being touched, feeling of foreboding, and flashes of light (Persinger et. al., 2000). So, not only could this be a possible cause for the ‘flecks’ of light, but also it could explain some of the other phenomena. This is certainly a possibility since amplitude modulated EMFs that could be considered EIFs were found at the location. Bear, D.M., & Fedio, P. (1977). Quantitative analysis of interictal behavior in temporal lobe epilepsy. Archives of Neurology, 34, 454-467. Braithwaite, J.J. (2004). Magnetic variances associated with ‘haunt-type’ experiences: A comparison using time-synchronized baseline measurements. European Journal of Parapsychology, 19, 3-28. Conesa, J. (1995). 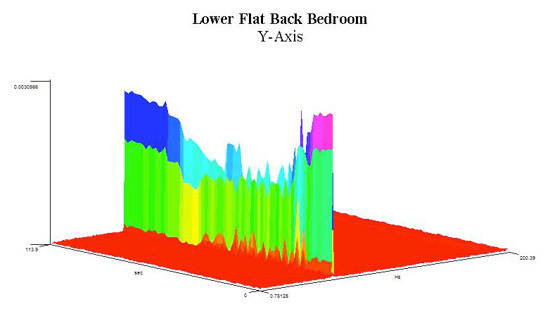 Relationship between isolated sleep paralysis and geomagnetic influences: A case study. Perceptual and Motor Skills, 80, 1263-1273. Conesa, J. (1997). Isolated sleep paralysis, vivid dreams and geomagnetic influences: II. Perceptual and Motor Skills, 85, 579-584. Cook, C.M., & Persinger, M.A. (2001). 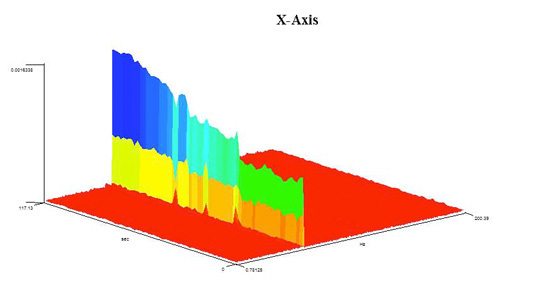 Geophysical variables and behavior: XCII. Experimental elicitation of the experience of a sentient being by right hemispheric, weak magnetic fields: interaction with temporal lobe sensitivity. Perceptual and Motor Skills, 2, 447-448. Geschwind, N. (1983). Interictal behavioral changes in epilepsy. Epilepsia, 24(1), S23-S30. Gllor, P., Olivier, A., Quensey, L.F., Andermann, F., & Horowitz, S. (1982). The role of the limbic system in experiential phenomena of temporal lobe epilepsy. Annals of Neurology, 12(2), 129-144. Goldensohn, E.S. (1983). Symptomatology of nonconvulsive seizures: Ictal and postictal. Epilepsia, 24(1), S5-S21. Horowitz, M.J., & Adams, J.E. (1970). Hallucinations on brain stimulation: Evidence for revision of the Penfield hypothesis. In W. Keup (Ed.). Origins and mechanisms of hallucinations (pp. 13-20). New York: Plenum. Makarec, K. (1990). Electroencephalographic validation of temporal lobe signs inventory in a normal population. Journal of Research in Personality, 24, 323-337. Makerac, K., & Persinger, M.A. (1987). Electroencephalographic correlates of temporal lobe signs and imagings. Perceptual and Motor Skills, 64, 1124-1126. Persinger, M.A. (1983). Religious and mystical experiences as artifact of temporal lobe function: A general hypothesis. Perceptual and Motor Skills, 57, 1255-1262. Persinger, M.A. (1984). Propensity to report paranormal experiences is correlated with temporal lobe signs.Perceptual and Motor Skills, 59, 583-586. Persinger, M.A. (1988). Increased geomagnetic activity and the occurrence of bereavement hallucinations: Evidence for a melatonin mediated microseizuring in the temporal lobe? Neuroscience Letter, 88, 271-274. Persinger, M.A. (1993a). Average diurnal changes in melatonin levels are associated with hourly incidence of bereavement apparitions: Support for the hypothesis of temporal (limbic) lobe microseizuring.Perceptual & Motor Skills, 76, 444-446. Persinger, M.A. (1993b). Transcendental meditation and general meditation are associated with enhanced complex partial epileptic-like signs: Evidence for “cognitive” kindling? Perceptual and Motor Skills, 76, 80-82. Persinger, M. A, Ludwig, H. W., & Ossenkopp, K. P. (1973). Psychophysiological effects of extremely low frequency electromagnetic fields: A review. Perceptual and Motor Skills, 36, 1131-1159. Persinger, M. A, & Koren, S. A (2001). Predicting the characteristics of haunt phenomena from geomagnetic factors and brain sensitivity: Evidence from field and experimental studies. In J. Houran & R. Lange (Eds. ),Hauntings and poltergeists: Multidisciplinary perspectives (pp. 179-194.). Jefferson, North Carolina: McFarland & Company, Inc.
Persinger, M.A., Koren, S.A., & O’Connor, R.P. (2001). Geophysical variables and behaviour: CIV. power-frequency magnetic field transients (5 microtesla) and reports of haunt experience within an electrically densehouse. Perceptual and Motor Skills, 3, 673-674. Persinger, M.A., & Makarec, K. (1987). Temporal lobe epileptic signs and correlative behaviors in normalpopulations. The Journal of General Psychology. 114(2), 179-195. Persinger, M.A., & Makarec, K. (1993). Complex partial epileptic-like signs as a continuum from normal to epileptics. Normative data and clinical populations. Journal of Clincial Psychology, 49, 33-45. Persinger, M.A., & Richards, P.M. (1994). Quantitative electroencephalographic validation of the left and righttemporal lobe indicators in normal people. Perceptual and Motor Skills, 79, 1571-1578. Persinger, M.A., Richards, P.M., & Koren, S.A. (1997). Differential entrainment of electroencephalographicactivity by weak complex electromagnetic fields. Perceptual and Motor Skills, 84, 527-536. Persinger, M.A., & Roll, W.G. (Eds.). (1985). The temporal lobe factor in psi phenomena. Metuchen, N.J. &London: Scarecroe Press. Persinger, M.A., Tiller, S.G., & Koren, S.A. (2000). Experimental simulation of a haunt experience and elicitation of paroxysmal electroencephalographic activity by transcerebral complex magnetic fields: Induction of a synthetic “Ghost”? Perceptual and Motor Skills, 90, 659-674. Roll, W. G., & Persinger, M. A (2001). Investigations of poltergeists and haunts: A review and interpretation. In J. Houran & R. Lange (Eds. ), Hauntings and poltergeists: Multidisciplinary perspectives (pp. 123-163). Jefferson, North Carolina: McFarland & Company, Inc.
Schick, Jr., Theodore and Lewis Vaughn. (1995). How to Think About Weird Things. Mountain View, California: Mayfield Publishing Company. Wiseman, R., Watt, c., Greening, E., Stevens, P., & O'Keeffe, C. (2002). An investigation into the allegedhaunting of Hampton Court Palace. Psychological variables and magnetic fields. Journal of Parapsychology, 66,387-408. Zusne, Leonard and Warren Jones. (1990). Anomalistic Psychology: A Study of Magical Thinking. 2nd edition. Lawrence Erlbaum Assoc.